The first entrance to be described is the ‘second veil’ (Hebrews 9:3). As with the furniture, God begins with that entrance that is closest to Him. It was through this Veil that the priest entered once a year into the very presence or Shekinah Glory of God. This was the way into the Holiest of All or the Most Holy Place. This Veil was much like the Curtains of Fine Linen that were placed over the tabernacle framework. 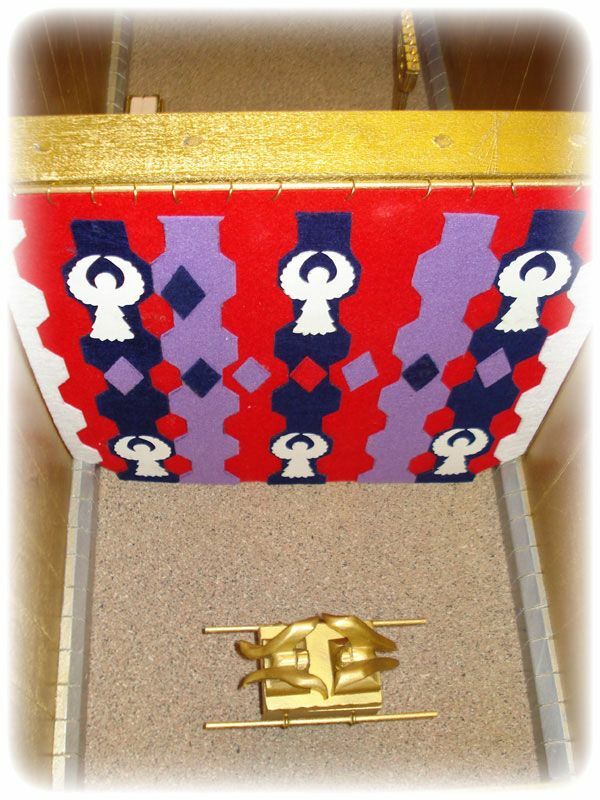 It too, was made of Fine Linen with needle work of like colors (blue, purple, scarlet). All these colors were to be inwrought in the Veil. The Veil was to be of cunning work and inwrought wisdom and Spirit of God. It was to be according to the Divine Pattern. Just as the Fine Linen Curtains had inwrought cherubim, even so this veil separating the Most Holy Place from the sanctuary was to have cherubim. This was the only difference between the Veil and the Door of the Sanctuary. This Veil was to be hung by hooks upon four pillars of acacia wood overlaid with gold. The Door to the sanctuary was upheld by five pillars. 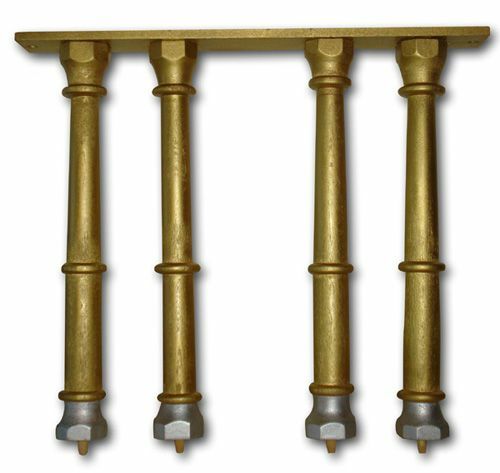 The five pillars of the Door were founded in sockets of bronze. But here the four pillars are upheld or founded in sockets of silver. These four sockets came from the “Redemption Money” of the numbered Israelites. The Veil was to be a divider or a partition between the Holy Place and the Most Holy Place. The word “veil” actually means “a separation, a curtain” or “that which hides.” This veil was to hide the Shekinah Glory from the eyes of men. It acted as a partition to separate sinful man from the Most Holy God. “But into the second (veil) went the High Priest alone once every year, not without blood which he offered himself, and for the errors of the people: the Holy Spirit this signifying, that the way into the Holiest of All was not yet made manifest, while the first tabernacle was yet standing: which was a figure for the time then present…”(Hebrews9:7-9). “And, behold ,the Veil of the Temple was torn in two from top to the bottom” (Matt.27:51, Mk.15:38 and Lk.23:45). This was an act of God, for the Veil was torn from top to bottom! This was nothing man did, but a divine act of God. This was in fact the Grace of God. Grace is God approaching man, and not approaching God. If God had not made the way open by tearing the Veil when Christ’s flesh was torn on the Cross, then that separation and division brought about by man’s sin would have remained forever. When God tore the Veil in the Temple it was symbolic act declaring to the entire nation what God had done with His Son. The rent Veil signified the fulfillment and abolishment of the Old Covenant, the Mosaic Economy and the Ceremonials pertaining to animal sacrifices and ritualism. In making the Mosaic Covenant old it marked the ushering in of the New Covenant to which all of the external form in the Mosaic Covenant pointed. It ushered in the spiritual realities which had been hidden in the external form (Romans 2:20). The death of Christ did not open the way to an ark and mercy seat, but to God Himself. Symbols are now fading away as realities pour forth their wonderful light. Christ dies to turn shadows into substance. The torn Veil speaks to us of the fact that the Way into the Holiest of All is now open to all men. When man fell into sin he lost his Way. In Christ the Way is restored. The Veil no longer stands as a separation between God and man. The middle wall of partition has been removed once and for all, from top to bottom, beyond man’s reach. God will never go back to that old form which was fulfilled and abolished in His Son. God has opened the Way. In Christ we have access into the very Presence of God, and we may enter “within the Veil” to behold the glory of the Lord that we might be changed from Glory to Glory. “Having therefore, brethren, boldness to enter into the Holiest by the Blood of Jesus, by a new and living way, which He has consecrated for us, through the Veil, that is to say, His flesh; and having an High priest over the House of God; let us draw near…” (Heb.10:19-22). Jesus is our High Priest who has passed with in the Veil and stands as our hope of entry. In Christ we have an abundant entrance into the Everlasting Kingdom of our Lord and Savior Jesus Christ (2 Peter 1:10-12). One more thing before we close, there were four pillars upholding the Veil, which interprets as His Flesh (Hebrews 10:20). The four pillars are seen upholding Christ’ flesh, or could we say, Christ’s ministry after the flesh. These four pillars our gospels. These are the only four books of the N.T. which present Jesus Christ earthly ministry; His death, burial and resurrection. The Book of Acts and the Epistles present Him in His heavenly ministry. Therefore, as the four pillars upheld the Veil, so the four gospels uphold the revelation of the “Christ after the flesh”(2 Corinthians 5:16-17). They show forth “God manifest in the Flesh” (1 Timothy 3:16). I so appreciate this, we are making a semi replica of the Tabernacle for this Sunday service. This has been a great tool for me to work from. I will return to this site and again thank you for your service to our Lord. Hi Lowanda, thankyou for your kind words. Use as much info as you want that's what it is there for. btw what part of the country are you e-mailing me from?